Hey, sports fans (and sports appy fans)! It's Grey Cup weekend here in Canada (while our friends to the south celebrate their Thanksgiving weekend and Black Friday sales – I'm sure you guys will be watching NFL games too). It's the 102nd Grey Cup and it's being hosted in Vancouver this year! Who doesn't LOVE sports watching food? Of course I have a taste for savory far more than I have a sweet tooth (which is obvious when you see the majority of recipes that I create and share). So there was no question that I needed to put a list of awesome Paleo Game Day Appies for Grey Cup and other sports events. I'm definitely going to need to find a crew to watch/eat with on Sunday! By the way, what are your favorite Paleo Game Day Appies for Grey Cup? Lemme know below! These are perfect! I think my favorite are the bacon-wrapped onion rings. Thanks for putting this together!! God, I want some right now! Peach and avo salsa?! I’m all over that! Thank you! You bet Renee, it’s a good one! Thank you Alyssa, I hope you get a chance to try some! 1. Great line up 2. Bonus points for the prettiest round up I’ve ever soon. Love the layout! Yay for bonus points! Thanks Cristina! Wow – what a great list! I can’t say I’ve ever had pineapple chips with guac but what a genius idea! Thanks Michelle, I like the sweet and the savory guacamole! Love this post ! Perfect for the upcoming Super Bowl Weekend ! What do you have lined up for game-day snacks? 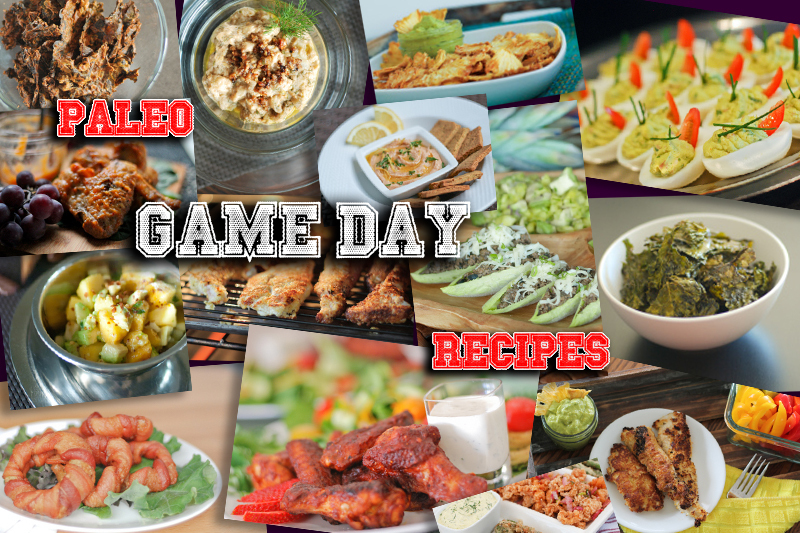 Oh, so many delicious recipes for the big game! I’m super impressed with how creative these all are! Thanks Jessica. Are you attending a Super Bowl party? Oh my goodness everything sounds amazing!!! I want #1, 2, 3, 4 and 12! SO yummy! Oh so many good finger foods!!! Love all the colorful and tasty foods on this list! This is a finger foodies paradise. Lovely! I don’t even like football, but all of this looks amazing! Bacon wrapped onion wrings?? Oh, my! Yeah, sports finals of all kinds can be a fun event for everyone. It’s a social gathering! Oooh, I’m eager to try those bacon-wrapped onion rings! Yeah, bacon-wrapped onion rings are amazing! So many awesome options here, but especially those Chipotle Strawberry Wings, there’s just something incredibly addicting about the sweet/spicy combo! All of the wing flavors we have on here have sweet and spicy flavor components. I love them all, but seriously, the one that keeps me up at night is the chocolate one especially with the mole sauce.